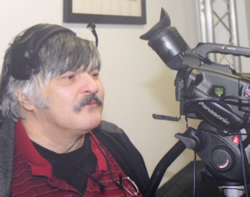 Robert Dunbar began his career in community media in Seattle, WA in the mid 1990's and continued to work at SCANTV until August of 2007 where the former Rhode Islander returned to New England. At first assisting with the start up of Portmedia in Newburyport, MA then lead the transition from a cable run access center to a non-profit in Revere in the summer of 2008 and was hired as the Executive Director in September 2008. Andrew has worked in community media for over a decade. He got his start in nonprofit TV working with Cape Ann Television in 2005. His greatest passion is teaching and thereby empowering people to create their own television shows, documentaries and short films. Andrew is looking forward to working with the people of Revere, helping them highlight themselves, their passions and our community as a whole. Currently, Rick covers the meetings at City Hall and is the voice behind Before The Council, seen during weeks when there is a City Council Meeting. He is also responsible for programming channels 8 and 9 to keep them from going dark and keeping the Community bulletin Board up-to-date.